Turkey, Pomegranate, and Ricotta Salad with Cranberry Vinaigrette is an awesome lunch for after the feasting! Miss Nichole from Pure Clean Fitness is here to hang out with us. I love having her visit and inspire our fitness! A Healthy Recipe- Turkey, Pomegranate, and Ricotta Salad with Cranberry Vinaigrette from me + a Healthy Gift Ideas from Nichole = a healthy, happy, and balanced life! Turkey, Pomegranate, and Ricotta Salad with Cranberry Vinaigrette is a scrumptious salad that you can put together in a few minutes for your friends and family to enjoy this Christmas season! This is the easy delicious after Christmas dinner meal that everyone will enjoy! Turkey, Pomegranate, and Ricotta Salad with Cranberry Vinaigrette is perfectly crunchy and wonderfully flavored! We love the texture that the pomegranate and walnuts add to this salad!! You may also enjoy our Baked Goat Cheese, Pomegranate, Orange Salad with Orange Balsamic Dressing, Harvest Chicken Salad with Raspberry Balsamic Dressing, or Blueberry, Almond, Chicken Salad with Lemon Honey Vinaigrette! Miss Nichole’s Healthy Gift Ideas. . .
Christmas is almost here and the countdown is on, I should probably start wrapping some presents to put under the tree pretty soon. 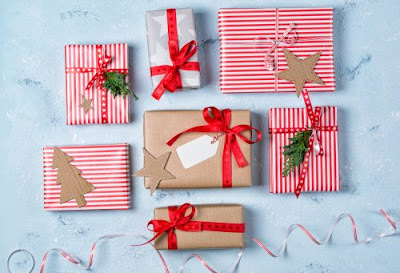 On top of getting presents wrapped I still have a couple people that I am clueless on, if you are in the same boat I wanted to share some fun healthy and fitness related ideas that you can give to that last minute person. I need to give a caveat here; you need to think of the person you are giving the gift too. A fitness or health related gift doesn’t make sense for some people and can cause I lot of hurt feelings and stepped on toes. Be smart about it and think about who you are giving the gift to. 1) A race entry. This is one that I have done in the past and it is in the works for this Christmas as well. In the past it has been a race that has been asked for. This year it is also for a runner and family. This year it is a gift not only of a race but of some family time together. 2) A fruit basket. We all love those adorable and delicious treats, but think of some treats that go beyond the cookie recipes. 3) A nice water bottle. This is one of my favorite gifts to get and to give. 4) Workout clothes. We all love cute and comfy workout clothes, whether or not we actually like to workout. 5) Awesome headphones. This is another one of those gifts you love whether you workout or not. A great pair of head phones can definitely help with a perfect run or great workout, but can also be great on the plane or walking through the grocery store. These are just a few ideas that I have loved to give and to get over the last few years. Hope you have a very Merry Christmas!!! Let our yummy Turkey, Pomegranate, and Ricotta Salad with Cranberry Vinaigrette be apart of your Holiday Season! Turkey, Pomegranate, and Ricotta Salad with Cranberry Vinaigrette be apart of your Holiday Season! Evenly arrange turkey and ricotta cheese on beds of romaine leaves. Wow, it’s such a great salad – really amazing. I absolutely love it ^^ Thanks a lot for sharing it with us 🙂 I will make sure to prepare it over the weekend! You just gave me a great idea of what to do with my leftover turkey ? Yes!!! That’s what this is all about. I’m so glad to hear that!